National Ag Day in Indiana, Farm Real Estate Agency Promotes AgDay! Increased knowledge of agriculture and nutrition allows individuals to make informed personal choices about diet and health. farmland real estate and other fields. Beginning in kindergarten and continuing through 12th grade, all students should receive some systematic instruction about agriculture. story of American agriculture and remind citizens that agriculture is a part of all of us. A number of producers, agricultural associations, corporations, students and government organizations involved in agriculture are expected to participate. National Ag Day is organized by the Agriculture Council of America. ACA is a nonprofit organization composed of leaders in the agricultural, food and fiber community, dedicating its efforts to increasing the public’s awareness of agriculture’s role in modern society. In addition to the events in Washington, D.C., on March 18, the ACA will once again feature the Ag Day essay, poster and video contests. 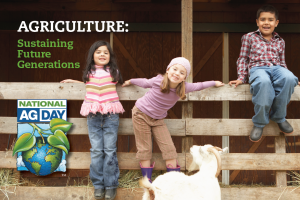 Visit www.agday.org for more information on National Ag Day in 2015.